I have several projects on the go at the moment and am enjoying painting such pretty pieces. In the next few weeks I'll be doing a lot of custom paint jobs - transforming some pieces that people thought they would throw away until they found my work and I'm delighted to be able to help them make these old treasures better suit their homes. The latest piece I have finished and it is now ready for sale is a lovely console. This would look fabulous in a hallway or lounge room. 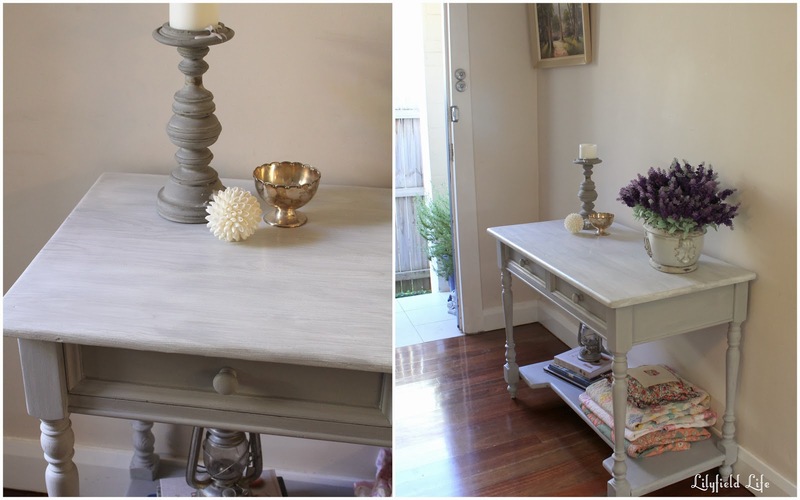 A gustavian grey console with grey/white washed top. It's very pretty and you can see the timber grain through the paint. Two drawers and shelf for good storage. For sale: email me for details or to inspect. so pretty and useful! i love that shelf on the bottom! Thanks Cassie – it’s a nice shape isn’t it. Big difference to the orange timber before hand. You did a beautiful job with the finish of this piece! I love the colors! thank you Sherry - much appreciated, I find these muted colours so calming and peaceful. much needed in my house!